I am an (over) 40 and fabulous (yes, I do say so myself) working mommy, married to a hunky firefighter, enjoying our son’s antics adjusting to life with his sister, our old golden retriever Crusher (rescue dog) and our two goldfish Nemo and Flower. Me A.k.A.Gingerbreadmama. My husband nicknamed me gingerbreadgirl when we first met because he felt my upbringing was more affluent than his. Like it mattered. We met in a bar 1996, actually on the sidewalk outside of a bar, and we’ve been together every since. I heart him. Hunky Hubby: Firefighter, athlete, fitness freak, very funny and totally hot. He’s a private person, so he’s not a big fan of my putting our life out there but he deals with it. Fussypants: Our 7 year old son is funny, whip-smart, and a tad emotional. He is a people-pleaser and a problem-solver. A good combo, I think. He is my snug bug. Hunky hubby has high hopes for his athletic ability. He plays club soccer, baseball, flag football and has a mean slap-shot. He also loves to sing. Little Miss: Our 3 year old daughter was a dream baby, very easy-going, with sweet personality. Now she is determined, sassy, dramatic and can conjure projectile tears faster than you can blink. She loves to shake her booty and is very fashion-savvy. Her first words were mama, shoes, poop, uh-oh and whoa. That should tell you something. But she is fearless and funny and we love her to bits. She is the perfect balance to our family. Crusher: He joined our family in October, 2011. We adopted him from an amazing rescue group, Stella’s Hope. He is incredibly sweet, gentle with the kids and thinks he is a lap dog. He chews the crap out of anything and everything though, including three of his own dog beds. I’ve learned to pick up my things and put everything out of reach. Hunky hubby is still learning. His wetsuit has teeth marks to prove it and they aren’t from a shark. Nemo and Flower: My son won a fish at the local street fair. His sister did not. She was sad. We bought her one from the pet store. The one from the street fair died a day later. My son was sad. We bought another from the pet store. Then we upgraded to a small tank. That I have to clean. And her reply, “Okay, that’s gotta be the funniest thing I’ve heard in weeks! You totally need to start blogging about your mommy experience. I’d totally subscribe, and it’d be a great way to continue your sharp, witty writing. Call the blog: “The Adventures of Captain Fussypants and Caleb the Wonder Dog” prompted me to create this blog. So here I am, blogging away, often wondering if I should be doing this at all. But then I remember that I’m not a particularly private person, I tend to project myself onto others anyway and I believe that discussing experiences is the best way to deal with something so it makes sense to silly-tize and chronicle my daily dealings. I hope you enjoy my ramblings as I sure enjoy (most days) living it. I tend to be long-winded and can, at times, own that soap box but it is my blog so I suppose that doesn’t really matter. We added to our family! Our beautiful daughter was born in 2010 and loves to steal the spotlight. And I’ve met other mommy bloggers who inspire me daily and I am proud to be a member of this community. 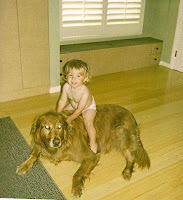 Our beloved Caleb, part of my inspiration to start blogging about parenting, went to doggie heaven. His bio, for memory sake: Caleb the Wonder Dog: Our 11 year old, blind 100 lb Golden Retriever has had issues since birth. Hunky hubby calls him the million dollar dog. He had his hips and knees fixed when he was a pup and lost his sight not long after. His sniffer doesn’t work very well, but he hears fine. If you even think about opening the freezer, he ambles over for an ice cube. He’s also lived in the same house his entire life but lacks any sort of spacial memory, muscle or otherwise, and bumps into everything. But he is sweet. Raising kids is an adventure, some days are (WAY) better than others but I wouldn’t change a thing and I feel blessed every day for my life and my family.